On any given day you can peruse eBay, Etsy, or any other online source of vintage watches and find a myriad examples of diamond-dial watches. Hamilton started applying diamonds to certain high end models in the 1940's and continued the practice though the 1960's with some lines totally dedicated to diamond dial models... for example, the Lord Lancaster line. You have to be cautious with diamond dial models though, because a lot of jewelers recased Hamilton movements in cases ornamented with diamond encrusted dials in an attempt to make more money than they would on a less expensive case. Often you'll see so many diamonds that the watch looks gaudy and borders on ridiculous. If you see a Hamilton watch with numbers made of diamonds, like a 12, 3, 6 and 9, you know it's not an authentic dial. To each their own, I suppose, but these ridiculous watches often come with a ridiculous price tag too. So buyer beware. That said, beauty is in the eye of the beholder and if the price is right and you like the looks, who cares? If the movement is a Hamilton it's still a quality watch, even if it's not entirely authentic. There could be a backstory to it that makes it special to you... for example, maybe your great grandmother had a jeweler embellish a dial for your great grandfather on their 50th anniversary? To you that watch would be priceless. Anyway, I recently received a watch in need of a little TLC from a fellow collector. It's a 1959 Gardner. 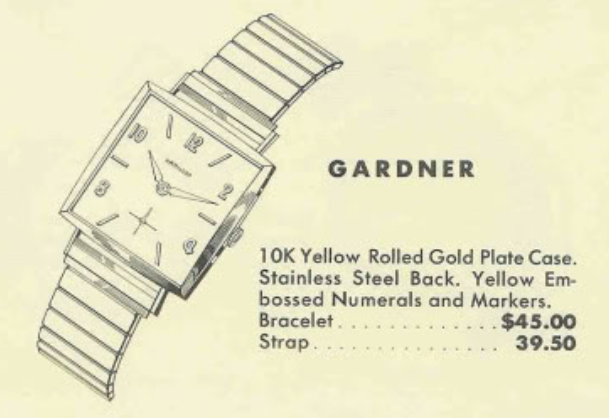 The Gardner was made from 1959 through 1961, so it could really be from any of those years. The Gardner came in a 10K RGP case with a stainless steel back. It's an entry-level watch but that doesn't mean it was inexpensive. $40 in 1959 was like $300 today. To keep the price point competitive, Hamilton used Swiss-made movements in their entry-level models and the Gardner uses a 17 jewel 673 grade which is based on an A. Schild 1200 movement. Even though the movements were imported, that doesn't mean they were low quality. They were just less expensive than watch movements made in Lancaster, PA. The finishing of the movements isn't extravagant but they are fully jeweled, well-made movements. Some Swiss movements were put in solid gold cases and every Hamilton Automatic had a Swiss-made movement. My project watch was outfitted with triangular shaped hour markers at the odd-numbered positions. Normally these positions would have had an embossed simple bar. The crystal was cracked and the slender lugs have been splayed out by a poorly fitted strap and / or spring bars. The stainless steel case back is unadorned and pops off with a little pressure applied to the lip between the lower lugs. The 673 is a very basic mechanical movement. The escape wheel has a cap jewel on the train bridge and the main plate is not jeweled at the center wheel - that keeps the jewel count at 17. The dial is textured with concentric rings. It beds down at the corners slightly and the coloring and finish looks a little off on the edges. I really can't do much to improve the looks of the dial, unfortunately. Any cleaning or aggressive treatment will likely lose the printing and make the dial look worse. So I'll try to keep the dial as-is. The mainspring barrel has a glob of mainspring grease that has hardened. That's a sure sign this watch is long overdue for a trip to a watchmaker. When old gels into a solid, the dirt and grime in the oil will accelerate the wear of the most delicate parts of a movement. Just because the watch runs, doesn't mean it's in good shape. While everything is in the ultrasonic, I'll prep a new glass crystal for installation. This crystal is square and 25.1mm by 25.1mm. I recently received a question from a blog follower about how a main spring winder works, or how to use one. So I'll show you step-by-step. First, you need a winder and there are several different styles. The process is fairly easy, you wind the spring into a holder and then press the spring from the holder into the mainspring barrel. So you need to first find a winder with a holder approximately the same size (or slightly smaller) than the barrel. I like to use K&D style winders, as their holders are adjustable and they come in three sizes so you can cover a broad range of barrels. The center of the spring has a hole in it to accept a tang on the barrel arbor. So you need to use an arbor to wrap the spring around when you're winding it into the holder. Notice the little post sticking out of this arbor... the hole in the spring will grab onto this post. Next, you want to make sure you put the spring onto the arbor in the right direction so you don't end up winding the watch backwards. The vast majority of the time the mainspring is wound clockwise around the winding tool arbor. So you position the end of the spring with the hole on the arbor and lock the spring onto the post. The arbor slides into the holder and the openings in the holder allow the spring to pass through. Now when you rotate the holder clockwise, the spring will slowly be drawn into the holder. Once the spring is "sucked up" into the holder like a piece of spaghetti into your mouth, just a few millimeters of the end should be sticking out. This end of the spring typically is one of two styles... US made movement will have a T-end or a post on each side that will go into a hole in the barrel. Swiss-made grades have a ledge recessed into the side that a young on the spring will catch hold of. You can see the tongue of this spring sticking upward at the end of this spring. Before I insert the spring in the barrel, I'll put a little mainspring grease in the barrel. It doesn't take much, just a tiny tab so the arbor will be lubricated (once it's installed) and the spring will slide inside the barrel. The spring floats inside the barrel and is constrained only on the each end... one end on the arbor and the other end on the outer wall of the barrel. Automatic movements have a clutch inside the barrel so the spring will actually slip inside the barrel once it's fully wound - that allows the watch to keep on winding while it's worn. When you wind the watch, the spring is drawn to the center (arbor) and as it unwinds it moves outward. I've had this same bottle of grease for about 5 years. To install the spring in the barrel, you first align the spring in the holder with the corresponding position of the barrel you want to push the spring into. Once the spring is free of the holder, it will expand into the wall of the barrel so getting it close is important... otherwise you have to remove the spring, wind it again and the reinstall it. Getting the mainspring arbor back into the barrel can sometimes be a challenge. I like to use my most stout tweezers but you can't squeeze too hard - a hard squeeze could result in a lost arbor, should it come loose of the tweezers. Notice the arbor has a tang on the side - that goes into the hole of the mainspring. There... the arbor is installed. Now I'll apply just a little more grease and push the cover back on. The cover needs to snap on fully so the barrel won't drag inside the movement. The teeth on the barrel drive the center wheel in this watch... this is technically the "first wheel". The movement is cleaned and dried and ready to go back together. The reassembled movement goes onto the timer... good amplitude, decent beat error and just 29 seconds fast per day beat rate. It's not as easy to adjust the beat error on this movement as it is on the ETA grades from the same era... so I'll leave that as-is but a tweak to the regulator can slow the watch down a smidgen. There... nothing too shabby about this performance. I straighten the lugs gently after installing the new crystal. This watch is from an era of dimensions in inches. So this watch should have an 11/16 inch strap. That's 17.4mm so a 17mm strap is a bit narrow and an 18mm is too wide. Since the watch has an 18mm strap, I'll trim a little sliver off each side so that it will fit better and use 17mm spring bars so there's less pressure to push the delicate lugs outward. And here's the finished project... a new crystal always makes a watch look dramatically better and the straightened lugs are a nice improvement too. The dial is a little better but there's only so much one can do with a textured dial. Overall, it was a good project I think, I'm sure this watch's owner will be happy with the results. The owner is quite pleased! Thanks, Dan.